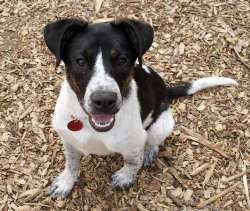 Angelo is a darling little six year old Jack Russell mix who is ADORABLE! He is a quiet, calm dog, but he also loves to play and is just an overall great little dog. He likes a stuffed toy and he will content himself chewing on a bully stick. Our volunteers spotted him in a very busy animal shelter and the workers there sprung him for us. He is house broken but has a small bladder so needs to be taken out often. He's good on leash and generally an easy dog. He's quiet in his kennel. He is available now. Bart is a sweet mixed breed dog who was rescued from St. Croix where he was turned in because his owner became too ill to care for him. He's lived in a house so would be an easy first time dog for someone. He is quiet and seems house trained. He is a least kennel trained as he keeps his area clean. He's good with other dogs that we've seen. He walks well on leash and rides nicely in the car. He is available as of 4/9/13. If you would like to meet him, please fill out the application online or if you already have an application on file and would like to meet him, please let us know or come meet him. Update: Bella was returned to the original rescuer as she needed a more rural setting. Bella is having a ball playing with all the dogs at the farmstead where she is staying. 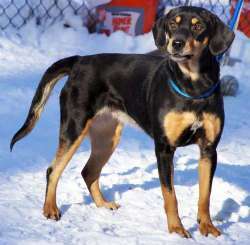 Bella is a 1-2 year old black and tan Dobie/hound mix. 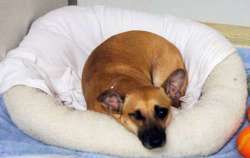 Bella has had two homes and was returned because she needs more socialization. A rural or county environment would suit her just fine. She is too reactive for a suburban or urban home. She is house trained and pretty well behaved. She is also crate-trained and accepts the crate readily when you have to go out. Bella is very attentive to her person, loves children, but is afraid of baby strollers and bikes. She gets along well with the dog-savvy cats, but will chase if they run. She's extremely affectionate to her people and she loves to snuggle with you. She knows sit, stay and come. She will stay off the furniture if you reinforce it. She loves her chew antler and also bones. She plays with the other dogs too, but would really like her own people, so might like it best to be an only dog. She will alert when strangers come and is a good watch dog, but also very affectionate to her people. Please apply on our web site if you would like to be considered for adopting Bella. She is available now. 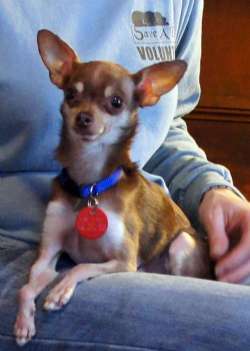 Boo Boo is an adorable and very tiny, 3 pound Chihuahua who is looking for a special home. He is too small for children so we are asking for an adult home only. He would love to be with another small dog. He is loving and affectionate and likes to go everywhere with you. He was found outside during a raging storm. He had a broken leg (which is healing on its own) and he had hair loss from poor nutrition. A Save A Dog rescuer took him in and fed him good food and brought him to us where we had him vetted and neutered. He is a little guy and has legs like a parakeet, but he's not afraid of anything. That's why he needs a special adopter to look out for him as we imagine he could get into trouble without a guardian angel. Boo Boo is in a foster home with other small dogs currently, so please put in your application and we will arrange for you to meet him. He would appreciate sponsorship to help pay for his X-rays, neuter, and dental. Thank you so much! 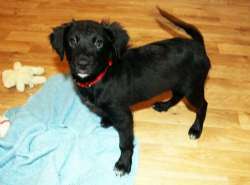 Carly is an adorable Lab/Border Collie pup who is around 4 months old. Carly's rescuer writes: I picked up Carly at the shelter. She was sitting all alone in a kennel and I could not walk away and leave her. 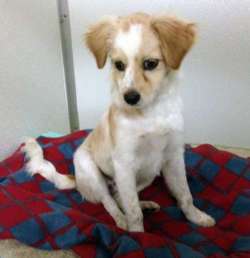 She is a wonderful Border Colllie mix about 4 months old who loves attention and tries very hard to please her humans. She is 98% housebroken, ( with a dog door). She has not had an accident in awhile. She loves to wrestle all day with Stuart and then they cuddle up for naps and to sleep all night on the same dog bed. Carly is a bit bossy, but Stuart doesn't mind and usaully gives in to her. Carly walks very well on a leash and she loves going for walks. She does get car sick! She has pretty good manners for a puppy. She does not jump up and is not mouthy. But she is still a puppy and forgets her manners sometimes. She will be available around 4/19. Claudia is sister to Clara she is 8 months old, spayed and a very happy girl. Everything is so exciting for her. 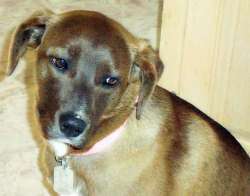 She has the most beautiful color and seems to be a chocolate lab mix, albeit small at 35 lbs. She gets along great with her foster brothers and sister and is really quite a tomboy. She is a dog park candidate, as she loves to play with all the boys, the rougher the better. she has a sweet nature and has never shown any aggressive behavior. She is currently living with small and large dogs and gets along well with everyone. She is house trained with a dog door, walks on a leash, but needs to perfect this so she can look her best while strolling through the neighborhood. Claudia is more high energy than Clara, when the fun dies down she settles down and would be great in an active home. Claudia and they were found trying to survive on garbage at a landfill in TN then were picked up by animal control. Save a dogs rescue partner in TN has had them fostered for 3 weeks and their time has come to find a wonderful home. 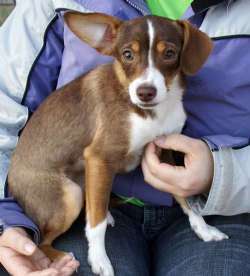 Cleo is a 2 year old spayed female Chihuahua/Dachshund mixed with other small breeds -- a real mutt, albeit small. She is a very sweet. She loves to cuddle, loves to give kisses and she enjoy going for car rides. She needs a home!! She loves walks too. She has dry eye so will need eye drops long-term. Cleo is such a cuddle bunny. She has a lot to offer as she's quiet and affectionate. She is friendly to kitties. She has shown no aggression towards any of the dogs at the shelter, but is nervous at introductions. She is afraid of some men and is afraid of trucks. She is house trained, loves chewies and squeaky toys. She looks bigger in the picture, but she weighs about 15-20 lb. She would love a place on your sofa where she can cuddle up with her head in your lap. Hi there! My name is Cliff and I am a German Shepherd pup. I am 9-11 months old. I love to play with balls, crawl into laps for a snuggle, and I like a good ear scratch. I'm curious about cats, but they scare me a bit. So I give them plenty of room. Don't be surprised if I bark when you come see me. It's my way of asking you to pay attention to me. I'm small for a Shepherd. Please fill out an application if you'd like to adopt me. I will be available 4/6/13 at our Meet and Greet from 12-3 PM at Save A Dog, 604 Boston Post Road, Sudbury, MA. Hi there! My name is Clifton and I am a happy little dog. I am almost a year old. I am friendly and playful and affectionate. I came from St. Croix where there are too many homeless dogs. 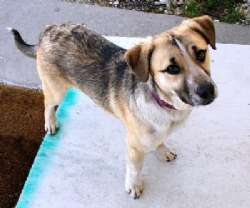 I'm a nice dog and need a forever home. My best friend is another dog, Bart, who is medium-sized. I am small, though, about 15 lbs. I am well-behaved and quiet in the car and I'm crate trained. A full time worker with a dog walker, or doggy day care would suit me fine. Please fill out an application if you'd like to adopt me, or if you have an application with Save A Dog already, then please email to let them know you'd like to meet me. I would love to meet you! Corina is 2-3 years old. She was a stray and was taken into foster care where there are lots of other animals. She is good with dogs/cats. She has some food guarding issues but only with other dogs, not people. We are working on this and she has greatly improved but will need supervision until she figures out her new surroundings. She loves long walks and attention from people. She will ruffle her hackles when 1st introduced to new dogs, but once all the sniffing is over, she is fine. She looks forward to her walks and enjoys the company and exploring in the outdoors. She does just fine playing and running around, she shares the toys. 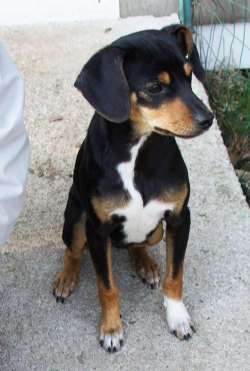 Overall she is very sweet little Beagle who is small in size. 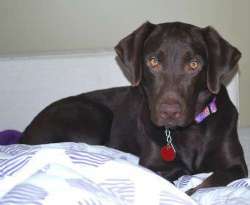 UPDATE on Eileen: SHE IS ADOPTED TO A WONDERFUL LOCAL FAMILY WHO HAS A YELLOW LAB AND KIDS WHO WILL PLAY WITH HER. Read her story: Eileen is a precious 2 year old Chocolate Lab who is living proof of the resilience of dogs and their ability to forgive humans for the things they do to them. Eileen is an amputee who walks well on three legs. We learned about her through an emailed picture of her pleading for rescue. She had been sitting in a vet hospital in Mississippi for two months following her surgery with nobody stepping up to rescue her. Our volunteers sprung into action and we raised the money to pay for her surgery. We elicited the help of a small army of volunteers and with cars, vans, and even a couple of small planes, brought her to the safe haven of Save A Dog. She arrived thin and looking haggard but within a few days her coat was looking great and she was bouncing around. Another hurdle in her recovery is that she is heart worm positive -- yes, after testing negative down south. So before she goes home, we will clear her of her heart worms. She's enjoying her foster home with a veteran Save A Dog volunteer and her two dogs. Eileen will run around and then to rest she leans on the Golden Retriever boy who is her pal. We think she got her name "I LEAN" from this behavior. 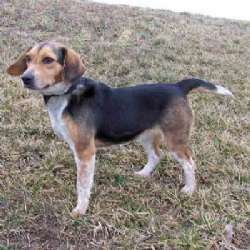 But she would love to be adopted as a Molly or a Maggie, so no worries, you can change her name. Wouldn't it be great if she had another Retriever to lean on in her new home? We're all praying for the perfect situation for her as she deserves the best, especially after what she has been through. Please help us raise the last bit of funds to cover her treatment and then she can go to her forever home. Thanks so much! 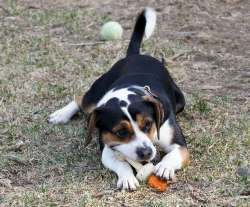 Frodo is an adorable 14 week old puppy who is looking for his forever home. He loves to play and is sweet and adorable. We're working on crate training and house training. He loves his toys and he tries to keep his kennel clean. Who would not want to adopt a darling pup like Frodo! Please get your application in so that you have a shot at this gorgeous pup. For families with kids we required a fenced in yard, but for an adult home leash walking is fine. He will need a stay-at-home or work-from-home situation as he's just a baby and needs the proper socialization and companionship. He can be seen during our drop-in hours at the shelter: 604 Boston Post Road, Sudbury, MA on Sat and Sun from 12-3 PM. 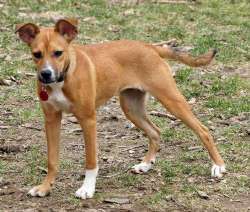 Hannah is a darling Basenji mix. She weighs 12 lbs, so maybe is part Shiba Inu as they are like a small Husky. 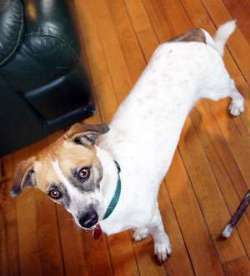 Hannah is smart, playful, loves people and other dogs. She runs and plays all day with her sister and 2 other puppies at my house and then they all come in for naps and plop down on a big fluffy dog bed. She does get up in large dogs face thinking they want to play, so she should be monitored around big dogs until you know they are friendly. Hannah has been using the doggy door in her foster home and hasn't had any accidents. She is available around 4/20/13. 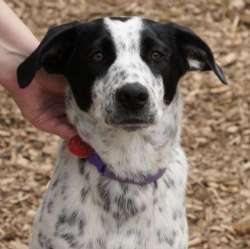 Kiah is a 10 month old female Pointer / Lab mix who weighs 40 lbs. She was at the shelter for awhile and the workers contacted us to come and get her because she was so sweet and gentle. Kiah is housebroken, will whine at the door to go out and do her business. She walks on a leash and loves her afternoon walks at the park. Her favorite person in the whole wide world is a 3 yr. old little girl. Kiah is crate trained and is good for a couple hours during the day while you run errands. She has never torn anything up in the house, but she is destructive of her own toys. She needs dog sturdy toys. Kiah loves water. Her foster mom took her to a park with a lake and Kiah jumped right in the water. Luckily, she was on a leash! She will be available on or around 4/15/12. Please fill out an application before coming to meet her. If you have an application on file, please email us if you are interested in Kiah. 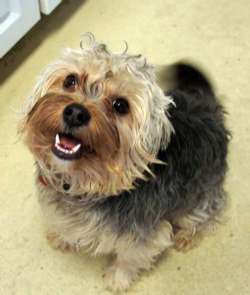 Lily is a 13 month old Yorkie who needs an adult home. She is a baby tiger when she gets excited and can be very mouthy. If she gets under the bed, do not reach in. Terriers can be willful little souls, so she would do best in a terrier-savvy home who will commit to reward-based obedience training. She weighs 11 lbs. and seems to be full grown. She is playful and will play with her toys while you sit at your computer. She's not a breed for small children. Lilly is a sweet energetic little puppy. She loves everyone and loves spending lots of time outdoors romping with her other canine friends, playing around water and carrying sticks in her mouth. Lilly loves to ride in the car and would be a dog you could take everywhere with you once she receives some obedience training. She makes herself comfortable and never moves until you stop. She is very good in the house, is fully house trained, and she will let you know when she needs to go out once she has settled down and feels at home. This little girl likes lots of toys and would live nicely with another small dog, although she will bark during the introduction and barks at strange dogs she doesn't know. Her foster mom feels Lily would benefit from some behavior training as her previous owner spoiled her quite a bit. She is fine with cats as she has lived with several, but she will try to play with them. We are requiring an adults only home for Lily. Visiting children must be closely supervised. Please be someone with flexible work hours or someone who can give her the time. She is available now. 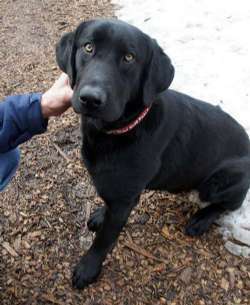 Loretta is a sweet 2-3 year old Lab mix who is super, super friendly and loving!! She gets along with EVERYONE!! She has a great personality and is gentle with cats. She has lived with both cats and dogs and is friendly with all. She is the type of Lab that everyone wants. She's shorter than your bigger Labs and is more like a medium-sized Lab. She's an easy to manage size. The poor thing was stuck in Mississippi and had to be treated for heart worm before coming here. On her way here, she stopped in TN for a few months to wait it out for her heart worm test to come up negative (the Dept of Agriculture in Massachusetts requires a dog to test negative before coming up). She is now testing negative so is here and available! What a sweet dog and she has waited a long time for her forever home. Please be someone who is committed to dog ownership as she deserves her final, forever family. We still need to raise some funds for her to cover her medical expenses and boarding. Available 4/20/13. 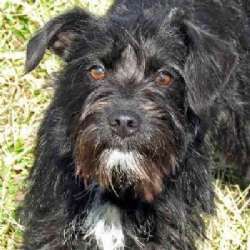 Maggie is a 1-3 year old Cairn or Scottie mix. She has the wirey coat. She came up from Indiana where she was relinquished as she wasn't fond of toddlers. We have a strong application for her and will take back up applications as well. She is available the first week of April. 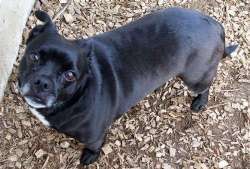 Manny is a spayed female black Pug/Boston Terrier mix. She is almost 6 years old. She weighs approximately 25-30 lbs and is overweight. She is good with kids and adults. Manny is fine with the family's newborn. She greeted the volunteer at the door with kisses and wanted a belly rub. Then she hustled back to sit in the chair beside her mom and the baby. Manny and Miley (yellow lab) have been together their whole lives. It would be great if we could place them together. Manny likes to lay next to your feet. She has not been around cats. We would love to place her with Miley as they have been together for years. See video: http://youtu.be/k1HVvELhwLw http://www.youtube.com/watch?v=BAYTSSICXrY Available 4/15/13. 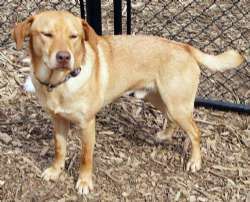 Mas is a sweet Lab who has been dealing with some health issues. During his health exam, the vet noted an arrhythmia so we will try to check that out or would prefer an adopter willing to adopt him 'as is'. He went to the cardiologist on 3/13 and had some tests to determine the cause of the heart disease. If the problem is because of a nutritional deficiency, then he will recover, but if it is genetic, then he will not get better. Blood tests will help us to determine the cause. He is currently about 73 lbs and is underweight. He should be at least 90 lbs given his overall size. He is friendly to everyone and is a good dog. He will go a long ways with a little training and patience. He showed up as a stray on a rescuer's property in rural Indiana. She and her husband took him in and he was shy about coming inside, but once inside he explored a bit and settled down. He is friendly with dogs and humans and curious about cats. He will stare at them and chase if they run. He is great on leash and good in the car, but needs some assistance with getting in the car at first. He likes the water and will wade in waist deep. He loves being with people and doesn't like being left alone. He has just been neutered so was allowed to mature properly. We could use some sponsors as his vet bill is around $700 thus far. 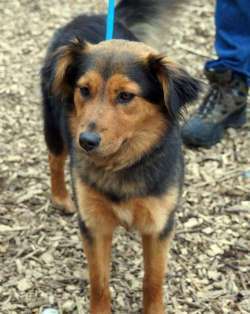 Hi, my name is Maya and I am a 10 month old Australian Shepherd/Collie mix. I weigh around 35 lbs. I'm a sweet girl who likes to snuggle. I like to play with other dogs. I was found as a stray with along with another dog. I was lost and lucky for me, someone nice found me. I was found in the countryside in Indiana. I came up to Massachusetts in hopes of finding a great home. I'm still learning to walk on a leash. If you are interested in adopting me, please fill out an application. I'll be available after my spay surgery. I'm getting spayed on 4/4/13 so will need a few days to recover before meeting you or your dogs. Mikey is a charming little guy who just arrived here in hopes of finding his forever family. He weighs 13 lbs and is good with dogs or cats. He was originally a stray and the family who took him in had another dog and no time for a second dog so he was brought to the shelter. He was so sad that he didn't eat for days while he mourned the loss of his family. He is doing well now and we're hoping that whoever adopts him will commit to him for the rest of his life so that he doesn't have to go through such emotional anguish again. 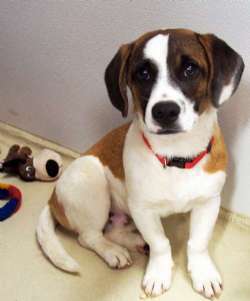 He will bond closely to his adopters and will be your best friend for life. Please apply on our Web site. He will be available weekend of April 5/6. 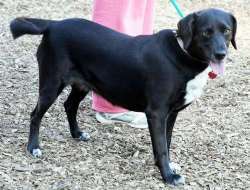 Miley is a sweet Lab mix who is almost 6 years old. She is spayed and a bit overweight but it's due to lack of exercise. She is super friendly and met the temperament tester volunteer at the door for kisses and petting. She did great during her temperament test - she was quiet and calm. See the videos. You can see that when we tried to get her to do a trick, she rolled onto her back. Her tail's wagging. She's got "sad" eyes. She's very calm and quiet natured. She will sit and shake paw. She sits quietly at your feet and will lay her paw on your knee. She likes belly rubs. She has not been around cats. We would love to place her with Manny as they have been together for years. See video: http://youtu.be/k1HVvELhwLw http://www.youtube.com/watch?v=BAYTSSICXrY Available 4/15/13. Millie is a little 10 week old puppy who is beyond cute. She came to us from the Virgin Islands and is acclimating to the snow very well. As long as she is taken out every couple of hours she is house trained. She sleeps the night in her crate no accidents or noises. She cries for attention when you're not paying attention to her, so we are working on that. She likes to play with the foster mom's little dogs but she settles down well. She loves toys and she loves to go on her "pee pads" but is quickly learning that going outside is better. She likes to watch TV while on your lap. She needs a stay-at-home situation or someone who is only gone a couple of hours total for the day. Small children would not be a match as she will be teething for awhile. Ten and up would be perfect for her. 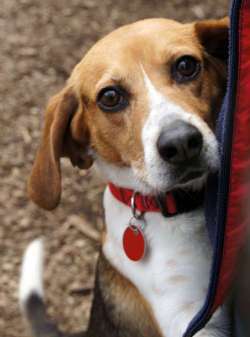 Or with another dog who will play with her as she loves to play.Millie will NOT be at Meet & Greet Saturday, March 30th. Her foster family is going away for Easter and she gets to go too. 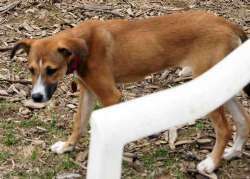 Nellie is a sweet natured spayed 6 month old mixed breed female pup. She was rescued from a rural TN shelter with her brother Ozzy and sister Mille. At first they were very scared coming out of the shelter and into their new foster home. They have since been socialized with kids, dogs and cats. Nellie is friendly and gives great kisses and snuggles once she gets to know you. Nellie is very smart and learns quickly. She is working on her house training, sleeps in a crate, walks on a leash and rides quietly in the car. Nell would do fine in a home with children, being a puppy she would love to have someone to play with. She also loves napping on the couch while you watch TV. She just wants a loving home of her own where she can learn to be the best dog she can be. She is available around 4/20/13. Hi there! My name is Orion and I'm a very people-oriented gentleman. I'm five or so years old, but you would never know it. 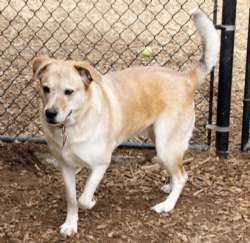 I am playful and acting like a much younger dog, so the shelter thinks I'm younger. I can stand on my back two legs. It's fun, it brings me closer to you, and sometimes even gets me treats for doing a trick. I am affectionate and love to be petted. I'm active, curious, and ready to go for long walks. I get along with cats. If anything, I'm a bit hesitant about them. I keep my kennel nice and clean. 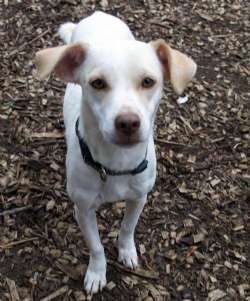 If you'd like to adopt me please fill out an application online. .
Ozzie is a sweet and gentle 15 lb. 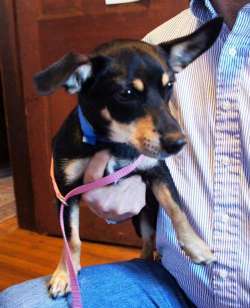 neutered 6 month old Min-Pin mix who needs a great home. He was brought into the shelter along with his 3 sisters. Our volunteer happened to be at the shelter the same day they were brought in by their owner and took them right home. Ozzie loves to be held, he is a little shy at first but warms up pretty quick. He is about 90% housebroken, but he does not like to go outside if it is raining. Otherwise, he loves to go for walks and struts around on his little leash. He loves to sleep on the sofa, but does well in his crate at night! He loves to sleep curled up with the cat. Small dogs have small bladders and need someone home during the day to make sure they keep up with their house-training. Available 4/20/13. Shishie is a young (2 year old?) 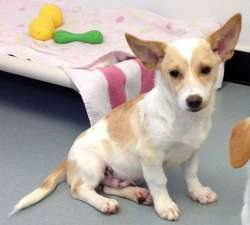 spayed female Corgi/Collie mix. We're not sure of her breed as she was found in a high volume shelter. She is beyond adorable, though, and under 20 lbs, 16 to be exact, so she would qualify as an apartment dog. When she was young she was adopted and returned for taking the clothes off the clothes line. How silly is that! She loves to chase a ball or to play with another dog. She's a lot of fun. She likes kids. She hasn't been tested with cats but would probably try to play with them. Update: We have moved Trooper to Coming Soon because he needs a few weeks still to gain his confidence in life so watch to see when he is available.Trooper is a really sweet 5 month old Basset Hound mix. He has been in foster care in Indiana ever since he was a very young pup. He is an outdoor nature lover, having spent many hours taking long walks through the fields and woods with his foster mom and all the other dogs. Trooper loves all dogs and enjoys playing at the waters edge. He is shy on introductions so will need a gentle adopter. He likes cats but likes very much to aggravate them in playful ways. He has lived with two very tolerant cats. They have shared the same bed on several occasions. He enjoys toys and chew sticks. He would be great with another dog to show him the ropes and build his confidence. Small children might be too much for him unless it is a quiet household with a very gentle child. He loves fresh chicken and beef or venison -- these are favorites mixed with his dry kibble. House training came easy for him. He will sleep through the night after being let out before bed, usually 9 pm. Trooper will give kisses and licks once he feels close to you. He is a really special pup who craves attention. A fence is required for Trooper as he does not have good recall yet but is learning "Let's go" for his come command. He is not leash trained as it was not needed where he stayed on the expansive farm. With patience and kindness, he will learn. He does well riding in the car although he does not go that often. No car sickness when he has ridden. He is not a barker but he is sure to let you know if something is amiss. This little guy will be a grand addition to any happy loving family. Please fill out our online application so that we have your information when we come to meet him. He is available after 3/6/13. 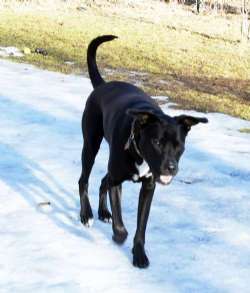 Tucker is a playful 18 month old Lab mix who needs a new home. His current owner works long hours and it is too long of a day for him to be in the crate so he has been with us and plays with Meryl, his girl friend, every day. They are like two peas in a pod. He would love a girl friend or to go to dog play groups and play with other dogs. His story: he was adopted at 9 weeks of age and has been with one owner. He's a great dog with lots to offer a dog adopter as he's an easy dog. He was in a doggy daycare until the end of December when the driver moved. He has good dog social skills and is all play bows. He can be shy with people at first, but then warms up and bonds quickly. When he was very young his veterinarian thought he had the potential of developing hip dysplasia so went ahead and did the surgery so that he would never have an issue with it. He is nice and tall so he doesn't even look like the type of dog to get it. He may have some Dane in him, but people might assume pit because of his white chest so if that bothers you, he is probably not the right dog for you. He is a really sweet boy who shows no aggression whatsoever. He is really a dream dog. He has never met a cat. He likes kids but wasn't raised with them and would need to be properly socialized. He is with us now at Save A Dog. If you are interested in meeting Tucker, please fill out the online application and we will make arrangements for you to meet him or come during our shelter visiting hours on Sat/Sun 12-3. Apply at www.saveadog.org. Vanessa is a cute pup who will be available for adoption soon. She is beyond cute and her pictures don't do her justice. She loves to run and play with her sister. She has some Collie features and a lanky body and legs like a Whippet, but we don't know if those are her breeds for sure as she is definitely a Heinz 57. A lovely puppy available to meet now. Vashti is a cute pup who will be available for adoption soon. She is beyond cute and her pictures don't do her justice. She loves to run and play with her sister. Vashti has the pink collar. She has some Collie features and a lanky body and legs like a Whippet, but we don't know if those are her breeds for sure as she is definitely a Heinz 57. A lovely puppy, available to meet now. 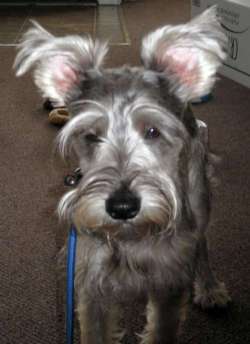 Zeus is a 7 month old neutered male Miniature Schnauzer. They don’t come any sweeter than Zeus. This special guy needs to be an important member of the family. He greets everyone with a friendly wag, is great with kids and loves when another dog wants to play with him. His favorite game is “Keep Away” with one of his toys. He also like to play with cats but will chase them in fun. Zeus really enjoys the fenced yard at his foster home to run and explore with puppy curiosity. Then he’s ready to come inside and snuggle. He is housebroken and rides well in cars. He has not mastered the leash so he needs some training with a non-choking harness. Also he needs continued work on not dashing out doors. Zeus craves human companionship so a stay home family situation is necessary.